Wanting cat stencils for pumpkin carving is understandable. Cats play a major role in Halloween as well as holding a special, if menacing, place in the world’s folklore and mythology! Thinking about Halloween crafts and projects? Well, it’s about that time. You know, for all the ghost and goblins to come out! It’s fun to get the whole family involved in the Halloween crafts So, when the weather turns cool and the sweaters come out, it’s time to head to the pumpkin patch or farmer’s market and start the search for the perfect pumpkin. And once you’ve found that one, you need to have the purrfect face to carve into it. 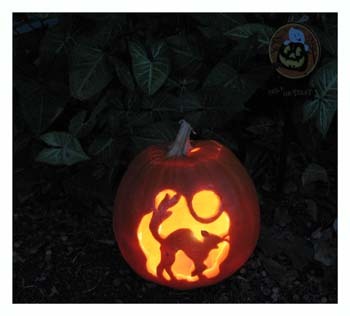 Using a creative stencil design can take your Jack O Lantern from a simple toothless face to an ornate scene. Don't miss the video at the bottom of this page for more Halloween craft ideas! We also have the how to’s of Pumpkin Carving with step by step pictures so that you can be much more creative with your pumpkin. You’ll be the envy of the neighborhood! Cat’s have always been connected to the dark side but there is no real explanation of the cat’s association with the occult. Of course, it’s private and slightly sinister nature, its apparently knowing stares and mysterious nocturnal wandering have done little to help its image. We have just the right design to make your pumpkin a scary masterpiece. 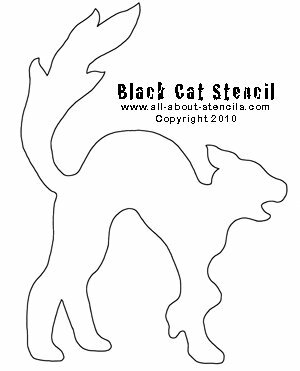 Use these cat stencils for pumpkin carving on your jack o lantern this year. Just right-click on the image and select print. It’s easy to understand how the folks of long ago could have looked at a cat’s eyes gleaming at them through the darkness and imagined that they were seeing an evil force, a witch in animal form. Don't miss out on our great Free Halloween Stencils We have six scary designs for you to print and did I mention - They're Free! And what would Halloween be without a few free pumpkin stencils? 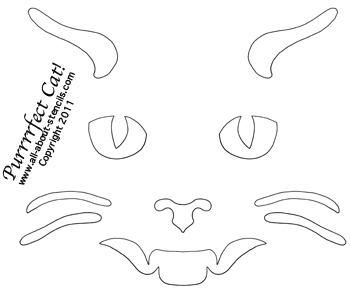 You’ll soon find out that we have sooooo much more than just these cat stencils for pumpkin carving. Want to make your own Halloween Mask this year? Well here's a cute Free Pirate Skull Mask Pattern Mask Pattern for you. Enjoy! Are you decorating with more than one pumpkin this year? Why not? 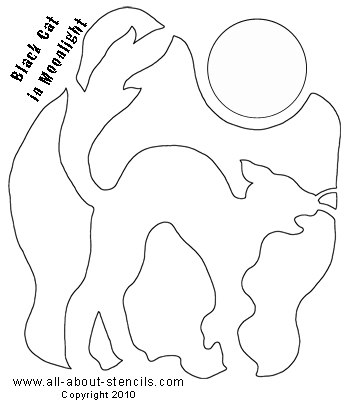 Well, we have a few more free pumpkin carving stencils for you. Pumpkin carving is easy with these cat stencils for pumpkin carving and the other designs because you can just print the stencil out and start creating your pumpkin masterpiece. 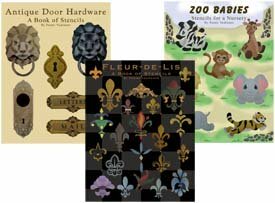 You can also find a large assortment of free stencils for many other projects like creating masks and trick or treat bags for collecting all the goodies. Keep searching this site! Maybe you just want a toothy face pumpkin. No problem! For a few creative Jack O Lantern Stencils for your pumpkin carving event then don't miss the free patterns we have to offer! You'll find great faces for your pumpkin and other Halloween Craft Projects you may be planning. Another great Halloween Crafts project that I want to share with you is painting a stencil design onto a pumpkin. Decorating your pumpkin with paint is much less messy and safer when getting the kids involved. Not to mention that you can be a lot more creative with paint while doing Halloween Crafts. Here’s a view of our flaming Jack with the above cat stencils for pumpkin carving pattern. When choosing a pumpkin stencil, try to imagine it with the light coming through those areas that will be open. Don’t like the mess of carving a pumpkin. You can use these free stencils to carve a craft pumpkin. Not only is it much cleaner you’ll have a pumpkin for years to come. Sound good? Well find out how at Pumpkin Crafts If you are a fan of recycle and ‘keep it simple’ you'll love this idea. 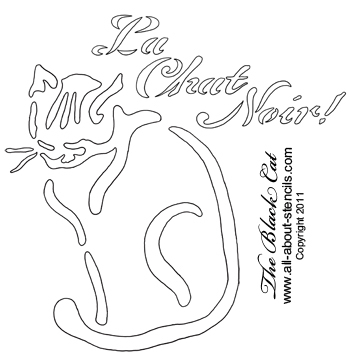 Since you’re looking for felines I thought you might like this little Cat Stencil. I don’t know if she’s great for a Halloween scare but I bet you can think of some other projects where she might come in handy. Oh yeah! Just click on the image for one. Just a side note: don't miss these free Pumpkin Stencils and the craft ideas that I share with you for using them. There are so many ways to have fun with Halloween crafts and stencils! I often think that making the decorations is the most fun part of any occasion and Halloween is no exception. I hope you get the most of the projects found on this page and create some funky or scary art. And hey! Don’t forget that I (and everyone else) want to see what you have done with your Cat Stencils for Pumpkin Carving. Just click on Stenciling Projects to get your masterpiece showcased here on this web site. Won’t that be exciting! Or if you have any questions or want to share information join in on the Stencil Blog. Well, I hope to hear from you soon. Well, here's that video I promised you. Enjoy! Return to Home Page from Cat Stencils For Pumpkin Carving. Return to Halloween Crafts from Cat Stencils For Pumpkin Carving.